The spikes in question are dermal spines (i.e. made only from skin, not bone), which means they rarely fossilise. In fact, for sauropods, they very rarely fossilise, because in general the only way to cover up a huge sauropod carcass before it rots is by high-energy transport that leaves coarse grains all over the place and doesn’t allow the sort of detailed preservation you need if you’re going to see direct evidence of soft tissue. So in fact the evidence of dermal spines rests (as far as I know) on a single specimen, that’s been described in a single two-decades-old paper (Czerkas 1992) which to be honest doesn’t make a particularly compelling case (at least in its illustrations) and in any case only shows that the spines existed over the distal part of the tail. Finally, the taxon in question is unidentified, and is described only as a diplodocoid. So what we know is that there exists a diplodocoid taxon whose distal tail had dermal spines, probably. So the question becomes how far — anatomically and phylogenetically — we can generalise that observation. Can we assume that the spines went all the way up the tail? Onto the torso? The neck? Can we assume they existed in all diplodocoids? All neosauropods? All sauropodomorphs? The answer of course — as with similar questions about feathery integument — is that we can’t assume, but we can legitimately speculate. For my money, any degree of dermal-spinage on any taxon of sauropod is perfectly legitimate. We simply don’t know whether and to what extent they existed on any given taxon. So palaeoartists who like them should feel free to go nuts. Czerkas, Stephen. A. 1993. Discovery of dermal spines reveals a new look for sauropod dinosaurs. Geology 20:1068–1070. There’s no other good argument against Spindler’s wooly sauropod, except that no direct fossil evidence has been found yet. …Except that “naked” mammalian skin and scaly skin are not equivalent integumentary states. This analogy really needs to be retired. Even “naked” Loxodonta have sparse hairs covering their skin, after all (e.g. : http://cdn2.arkive.org/media/A1/A1264781-5D7E-417B-A223-630697546C8F/Presentation.Large/Forest-elephant-bull.jpg). I am not sure there is anything equivalent known among squamous integument. The problem is that evo-devo studies show that many of the “scales” on bird feet are actually feather placodes that are developmentally stunted (Sawer & Knapp, 2003; Dhouailly, 2009), so unless all dinosaurian scales are secondarily derived from feathers/proto-feathers/filamentous integumentary appendages, the elephant analogy doesn’t work (and is still not really a properly equivalent analogy, since naked skin is not formed by developmentally arrested hair growth). Dhouailly D. A new scenario for the evolutionary origin of hair, feather, and avian scales. J Anat 2009;214:587-606. I agree generally with above points, but. We have little option to discuss the deep evolutionary developmental details of integument in sauropods; merely cold-hard facts. First, we have to consider that the EPB is ambiguous on this score, down to the scutellae on brids’ feet: Crocs have scales (real ones) and birds do not (at all). Non-avian dinosaurs are caught in the middle. Second, we have direct evidence of squamous integument in many dinosaurs, some of it quite pervasive (ceratopsians, hadrosaurs) and size likely a non-factor (see, Psittacosaurus). Third, we have neonate sauropods, which have squamous skin. Of course this material is restricted to some parts of the body, but if it were fuzzy, wouldn’t the head be one of those parts? Look harder. We are in no state to call off wooly sauropods, however odd they may seem. Heck, I drew a wooly ankylosaur (not that I think it is likely). Why not even ankylosaurs? To find an analogy: extinct Xenarthra had both, the bony scutes and fur. If the climate is cold, evolution invents the easiest way to make the animal warm: growing fur, fuzz, feathers, fat, etc. What is a bit puzzling is that birds have feathers and mammals have fur (with a few exceptions) no matter where they live. A wooly brachiosaur does indeed seem possible. Although there is no evidence yet, of feather type structures in sauropods. One line of evidence to help answer this question is do we have any polar sauropods? Another being, what is the paleoecology like in polar regions during the time of sauropod diversity? So far, I don’t know of any sauropods being found in polar regions, I could be wrong(someone here may know of if any sauropods are found in polar regions). A Titanosaur was recently found in an area of the Southern Polar region. There is definite scientific evidence though that cretaceous North American dinosaurs were living in polar conditions(pachyrhinosaurs, hadrosaurs, and some theropods). Studies of fossil plant flora show that these environments could reach freezing or near freezing. As far as paleoecology goes sauropods lived in a variety of habitats. While the Morrison Formation has been interrupted as dry and savanna like with seasonal climate. The Tendeguru is thought of as being wetter than the Morrison. When other vertebrates are looked at, like crocodiles and other reptiles these can be used as indicators of past climates. Although one could counter argue why are the crocodilians and turtles smaller in the Morrison formation? While they are giant crocodilians in the Plio-Pleistocene in Kenya? (CA Brochu, GW Storrs) A period which is thought of as a time when climates were becoming cooler globally. In conclusion Spindler’s Wooly Brachiosaur does raise some fascinating questions about dinosaur appearance and paleoecology. Overall it is a great piece of paleoart that make you think. Just to be clear: that tells us that those neonate sauropods had squamous skin. It doesn’t tell us about others, any more than than the naked skin of neonate African elephants tells us that mammoths were naked. (scratching his head). Why is it a woolly sauropod? Is this mere homage to a mammoth? Why isn’t it a shaggy sauropod? Perhaps this is just my enjoyment of shaggy dinosaur stories, but I honestly don’t get how you make wool out of feathers of any sort. I should point out that my comment was not meant to denigrate the possibility of fuzzy sauropods, but to point out that the common analogy used to argue for fuzzy sauropods (i.e., furry mammals vs. their (relatively) hairless relatives), or indeed, any other dinosaur for which squamous integument is assumed, is not applicable. In fact, I would say considering we have ornithodirans from three fairly disparate lineages (pterosaurs, Tianyulong & various coelurosaurs) with some sort of fuzzy integument would suggest, at the very least, there was a genetic predisposition to evolving fuzzy integument among them. Or maybe fuzzy integument is a basal characteristic of ornithodirans. And yes, I see no objection to armored dinosaurs with fuzz, too, as long as the scutes were covered in epidermal layers that could house fuzzy integument (as seen in pangolins and armadillos). Except, again, many (though not all or even most) mammals (and birds) start life off relatively naked, whether or not they grow up to be fuzzy (in the case of mammals). This is not true for any living animals that have squamous integument (that I know of at least). The difference being that if you found a fossil baby mammal with naked skin, one could not say whether the adult was fuzzy or naked in life without more evidence. Furthermore, as I said earlier, African elephants aren’t completely naked, they still have sparse hairs (and Indian elephants, which are found to be phylogenetically closer to mammoths, can be down-right hairy (especially the neonates! 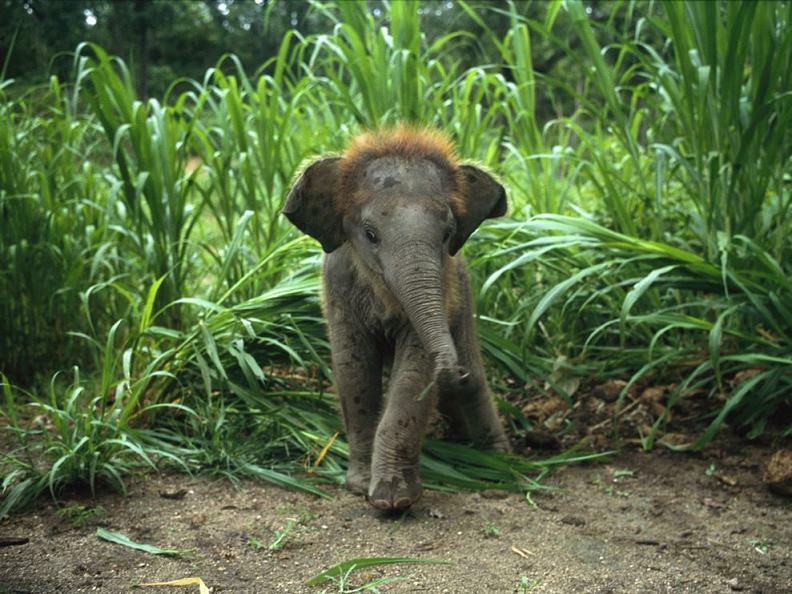 ): http://twistedsifter.files.wordpress.com/2010/12/baby-asian-elephant.jpg). Again, the mammal analogy is not applicable. This is different in birds, where the same gene regulators that suppress feather development in featherless birds also suppress the formation of their “scales” (see refs I cited above; and the recent featherless chicken breeds demonstrate this as well – notice no scales on the feet: http://assets.inhabitat.com/wp-content/blogs.dir/1/files/featherless-chicken.jpeg). So if we were to find scaleless sauropod embryos, we couldn’t tell whether they would have been feathered or just completely scaleless (although this might support them being secondarily scaled, as crocodiles and squamates – which have true scales – invariably do have scales while they are in the embryo). Does anyone know anything about integument preservation in fossil bird embryos? Yes, I used “wooly” by analogy with mammoths. “Shaggy” is just fine if you prefer. Note: This exact argument can be made for scaly Utahraptor and Deinonychus. It can also be used for drawing scaly Hesperornis or wooly Redondasaurus. There is no reason to think that the preserved specimens we found are the exceptions rather than the rule. What is the theropod in the picture? I’m assuming Allosaurus or Torvosaurus, but I just wanted to ask. Seeing two woolly dinosaurs is kinda weird to me, but an interesting idea none the less. In response to Beri’s comment above, and to the possibility of wooly (or “shaggy”) ankylosaurs, I never just say there isn’t or shouldn’t be. I draw comparisons from as many sources of data as I can. But I place those data into hierarchical ranking, and give more weight to hierarchical data, and what is actually preserved is pretty close to the top. We can draw inferences from extant and even extinct taxa (the latter being a weaker inference, as we lack developmental data and direct observation) and some metabolish evo-devo regimes and expectations. But if we enfluffen our sauropods, and I see evidence of sauropods without this fluff, I’ll draw the necessary conclusion that they weren’t likely enfluffened. We have partial mummies of ankylosaurs and a half dozen hadrosaur mummies along with tens and tens of hadrosaur skin patches that tell us there is a moderate inference against hadrosaurs, even if we can plop them on there for some taxa. But it’s a romantic idea and our data insufficient to strengthen our inferences. sounds like a detailed search into the coprolites belonging to the local carnivores is in order. Thanks for clarifying. I did read your blog’s About page, but since it doesn’t give a real name, I couldn’t tell whether Palaobabbler was a nom de blog for Spindler. I’m coming to this very late, but this is one of those cases where the comment thread is arguably even more informative and interesting than the original post. Thanks, everyone, for the thoughts, and thanks especially to Zach for the sweet ARKive links–that baby elephant is awesome! This is still late Jurassic.There are no poles. Giraffatitan lives in a semiarid environment. Where are the polar relatives? I like and understand the new approaches of “shagginess” in ornithodirans, maybe even as an ancestral trait. But one thing that the “All Yesterdays” movement is somteimes ignoring is the overall biology of these creatures: Just because they’re big doesn’t mean they’re mammals. 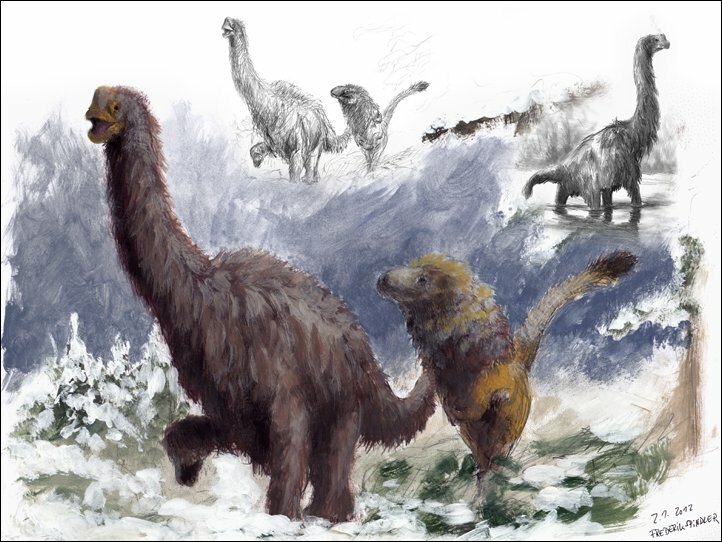 And one last thing (not as criticism, as a question): could a giraffatitan, weighing -30+ tonnes (a different subject matter) and assumingly living in a cold climate, develop fur for insulation? At five times the mass of the largest animal that we know for sure did it too?